Many women living with fibromyalgia and menopause have a fear of going into menopause that is either natural or induced surgically through hysterectomy. 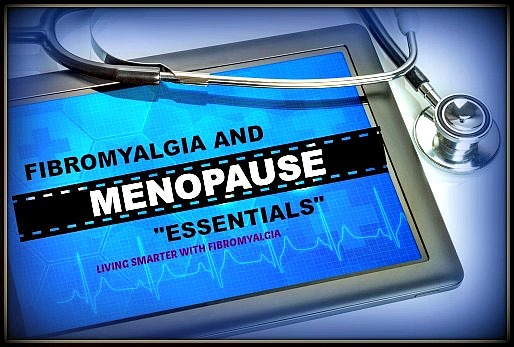 More than ever before we have to address lifestyle factors and what I like to call “menopause essentials” in order to avoid the pitfalls often associated with fibromyalgia and menopause. I want to stress something of great importance here. Avoid saying and thinking that your fibromyalgia will get worse during or after this time. Oh yes, it can and will get worse if we do not adhere to these menopause essentials we are going to outline in this article series on menopause and hormones, but is it the fibromyalgia, the severe depletion of hormones and system support, or is it a combination of both? We think it is both, and along with normal aging factors, we must address this issue carefully and thoughtfully. Working as a practitioner in holistic health for many years, living with fibromyalgia and other fibro co-conditions since a young age, and going through surgically induced menopause myself, I continue to refine the “menopause essentials” and the best protocols when living with fibromyalgia and menopause. Please do not overlook the importance of this series of articles as I implement a combination of tools that will aid anyone in understanding how to better approach the issue of fibromyalgia and menopause. There will of course be individual decisions that need to made with your doctor in regards to hormones and hormonal support therapies, but if your current hormone replacement is not working for you OR you are concerned about the safety and effectiveness in the long run, then more knowledge is power. Maybe you are not quite yet to peri-menopause or maybe you are way past the menopause days and think this doesn’t apply to you, but there could be adjunctive progesterone hormone therapy that could benefit you and your fibromyalgia and menopause symptoms. If you are also dealing with environmentally induced anxiety symptoms or thyroid and adrenal stress, this could also be of benefit. If you have suffered with estrogen dominance, you likely felt the result of that in a negative way and rightly so because estrogen is inflammatory whereas progesterone/testosterone are anti-inflammatory. So here is some good news. Let’s say you have lived much of your younger adult days like myself with estrogen dominance. You have lived with hormonal imbalance. Your body has gone “haywire” in the hormone department and over-produces estrogen but under produces progesterone and/or testosterone. Then, you go through surgical or natural menopause. Now, it is possible through natural bio-identical hormone replacement to have some control as opposed to when your ovaries were playing “havoc” and you had little control. You cannot get up every morning and tell your ovaries how much hormone to produce for you that day, but with replacement, you are in control. Stay positive and keep working at it. NOTE: an initial visit to a hormone specialist (independent of your endocrinologist or your ob/gyn) is a worthwhile investment that can make a difference in your fibromyalgia and menopause for years to come. Before we get into other factors, let’s be sure we are addressing the basics. Learn the Pros & Cons of both Bio-identical and Synthetic Hormones. 1. If we ever needed a comprehensive vitamin/mineral regimen, it is during and after menopause. Minerals affect estrogen production and balance. However, with minerals such as calcium, it is imperative to only get your calcium through either food, vegetable juices or in food grade supplement form such as raw calcium (refer to calcium/vitamin K article). Increasing calcium intake through inferior supplements can interfere with vitamin D production and cause an imbalance. Mineral synergy with minerals like calcium and magnesium and balanced hormones is the best insurance for bones and prevention of osteoporosis. We also need adequate hydrochloric acid (HCL) in the stomach and natural enzymes from raw foods. As a colon therapist, I am not just interested in “detoxing” the body, I am even more interested in nutrient absorption in the small intestine and keeping the initial elimination channels open (liver, gallbladder, kidneys) for instance. Extra benefits include: Vitamin C supports collagen production for our skin; Boron supports estrogen production; ubiquinol and vitamin B complex provide energy; and magnesium and malic acid support muscle health and relaxation. With Vitamin K, take caution if taking warfarin or certain prescription medications, blood thinners, etc. Talk with your Doctor. Phyto-estrogens include things like flax seed meal and broccoli sprouts ; in fact, those are two of my favorite food substances to use when enhancing phyto-estrogens. I often include these in my blended drinks to really increase the overall nutrient value. Zeno-estrogens are essentially endocrine disruptors; they are not natural to the body. Because the fibro body is ultra-sensitive to any disruption in the endocrine system, this can exacerbate all fibromyalgia symptoms. Again, this is not about perfection, but avoiding hormones, antibiotics and pesticides in food as much as possible is essential for those of us living with fibromyalgia and menopause. Allow me to share a few paragraphs from a resource, (“Menopause Naturally” by Kathleen Fry, MD. and Claudia Wingo, R.N., Medical Herbalist), and then I will add more in-depth information that is more current for today’s treatments of fibromyalgia and menopause. "Phytoestrogens have a normalizing effect. They work in cases of estrogen dominance, characterized by fibroids, fibrocystic breast disease, and PMS. They also work when the body is not producing enough estrogen, as in the case of menopause. While phytoestrogens mimic estrogens, they are 1/400th as potent as synthetic estrogens. For menopausal symptoms, we have found that phytoestrogens containing herbs offer significant advantages over conventionally prescribed estrogen. Although estrogens may pose significant health risks, including an increased risk of cancer, gallbladder disease, and stroke, phytoestrogens are not associated with these side effects. Foreign estrogens, known as zenoestrogens, come from hormones in chicken, herbicides, pesticides, and other environmental or food sources. They may mimic estrogens in the human body. However, because they are foreign substances, these estrogens do not fit perfectly into the body’s estrogen receptor sites. Because not every woman is going to respond to the herbal treatments for fibromyalgia and menopause (and maybe we are working to simplify our supplement regimen), I personally believe and have found agreement in multiple resources, that natural progesterone (in troche sublingual or cream form) continues to be the most effective at treating a variety of symptoms we experience in menopause and fibromyalgia. Natural progesterone has positive side effects. Dr.Platt, author of “Adrenaline Dominance”, believes that the osteoporosis epidemic is often due to low levels of progesterone. You will need to work with your doctor on which form of progesterone is right for you, either cream or troche form (oral) as we want to bypass the liver whenever possible. A little of my own personal experience: Since I was a teenager, I tended toward hormonal imbalance, then into my twenties and thirties, estrogen dominance. I never took any kind of estrogen hormones for any reason. My body did not need more estrogen. However, when I was put on natural progesterone for PMS in my twenties, it helped the symptoms a great deal. As I got busy in my life later on, I stopped using the progesterone for whatever reason, and continued to struggle with imbalance, but I would also have times where I did feel balanced without any outside assistance. I had the typical PMS, fibrocystic breast disease and eventually fibroids. Awhile back, after my own hysterectomy, I visited with my hormone specialist right about the time the hot flashes were kicking in and getting unbearable (about 2-3 months post-surgery). I opted for natural bio-identical progesterone and testosterone/DHEA. Now, there are a couple of different forms we advocate but this does not include straight oral capsule form. 1. Natural progesterone cream. This is best to be obtained by prescription, as the over-the-counter brands do not contain the more therapeutic dosages needed to mediate symptoms and protect the body. 2. Oral Dissolve Troche. This is like a sublingual form, which dissolves VERY slowly between the cheek and gum. It is different from capsule form but may still have to go through the liver. What dosage will be right for you? Work with your doctor to find the most effective one. Most women find a dosage between 150-200 mg progesterone daily helps to eliminate hot flashes, protect bones, and create a greater sense of well-being. However, I break it up to keep a more steady stream of relaxing progesterone in the blood stream. Progesterone has a rather short lifespan in the body. I take 50 mg. before breakfast, and then 100mg. about 30 minutes before bedtime. I use the troche sublingual form and the cream form. Work with your “hormone specialist” doctor to prescribe and fine tune your dosages (Note that your ob/gyn may not be your best option for a "hormone specialist".). If you are currently taking synthetic estrogens and you have concerns about health issues associated with them, you will need to work with your doctor on weaning off of that hormone therapy before starting another. This is very important. The doctor would reduce the hormone therapy slowly. However, even if you decided to stay on estrogens like Premarin for whatever reason, you could still talk with your doctor about adding natural progesterone to balance. Remember, natural progesterone also helps with sleep. When I started taking 100 mg. at night, I noticed it putting me to sleep within about ten minutes of getting into bed. Now, that is likely the most POSITIVE side effect we could ever ask for when living with fibromyalgia and menopause!! Again, I take 50 mg, progesterone in the am, and then 100mg before bed. Never worry about missing a dose here and there; it’s more about consistency over the long run. With fibromyalgia and menopause, comes the need for extra bone protection. Along with natural progesterone which helps bone density, we also want to consider a few supplements and natural foods. Of course, juicing vegetables will give us raw nutrients and enzymes right into our bloodstream. We don’t have to juice every day though. In my juicing/blending article here in the website, I recommend making juicing a part of your weekly schedule. I also use a small amount of MACA powder in my blender drinks. Maca is a great hormone balancer and excellent for menopause. Work with your doctor on dosage although this can be obtained online or at your local health food store. stress control (use our mind body techniques in this website. In particular check out my "Coping with Fibromyalgia" article. Stress affects bone loss. Vitamin K (helps with calcium absorption into bones, however take caution if taking warfarin or certain prescription medications, blood thinners, etc) Talk with your doctor. Ok, many people are avoiding dairy products these days. With allergens and antibiotics (zenoestrogen), this may be a food group that you have already eliminated. Again, using the above suggestions will support bones. Dairy without fat is useless. Never use non fat dairy products. They are too high in casein (dairy protein) and no calcium will be absorbed anyway. Not everyone has difficulty with dairy, so if you include dairy in your diet, use organic goat milk products, ghee, and/or no less than 2% fat or full fat dairy. Almond milk or coconut cream only have small amounts of calcium, depending on whether store bought or made at home. NOTE: This is the first article of a series that will also include "fibromyalgia and menopause" exercises and lifestyle factors that will address both increasing bone density and strengthening those areas of the body that can become more vulnerable after surgically induced or natural menopause.